For the sake of both the earth and our own health we mustn’t just think about what we put into our bodies but what we put onto them as well. We should all make an effort to invest in products that are ethically sourced and cruelty-free, and also brands whose profits have a positive domino effect. Luckily there are a whole heap of brands that do just this, and Akhal Beauty is one of them. On a trip to South Morocco, Myriam, Akhal’s founder, discovered that the workers who harvested the Argan oil we love so much were not benefitting from it at all. So, in an Argan forest wedged with dead trees and plastic, Akhal Beauty was born. Akhal (pronounced A-khal) is a Moroccan word that means “earth”, and it was chosen for this reason exactly: it honours the origins and makers of the products Akhal Beauty creates, and it also communicates the business’ commitment to an eco-friendly, zero-waste skincare range. Oh, and did we mention that it’s also 100% USDA Organic certified? Akhal is a for-purpose organisation. Basically, they use Moroccan-sourced skincare as a tool to help promote women’s development and children’s education in Morocco’s rural south. Akhal uses a model much like TOMS Shoes, where for every pair sold, another pair is given. For every bottle sold by Akhal Beauty, $1 is given to Education For All, a charity operating boarding houses for girls who can’t afford to travel from their villages in the High Atlas Mountains to the nearest school. Education is a human right and Akhal—with your help!—is doing their part. With your hair, face and body covered by their incredible range (the Prickly Pear Oil and Rhassoul Clay Facemask are two EME favourites), Akhal could be your one-stop shop for all things beauty. 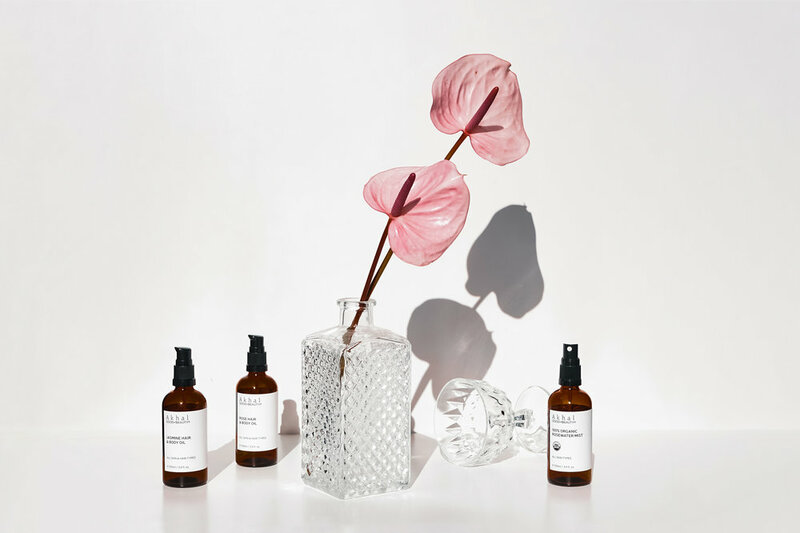 It’s refreshing having a skincare brand that cares not only about the purity of the ingredients in their products but also how these ingredients are sourced, and the effect this has on the consumers and workers alike. An interview with Myriam, the founder of Akhal Beauty. What made you start Akhal Beauty? On a trip to the South of Morocco in 2016, I ventured into the Argan forest and was very surprised to find a lot of dead Argan trees and plastic rubbish wedged between branches. After talking to a few villagers who took part in the Argan harvest and seeing the way they lived, it became obvious to me that the people we owe this beautiful oil to did not benefit from it. It was a problem I could do something about and that was the impetus to create Akhal Beauty. What is something other's wouldn't know about Organic Beauty that you think they should? There are two components to making high performance organic skin care sustainably I wish there was more information on. The first one is the farming process itself. Unlike conventional skincare, organic beauty uses mostly plants. Some of these natural ingredients require a lot of irrigation water. In today’s environmentally challenged world, it is a waste to use freshwater to irrigate plants for skin care products when perfectly suitable alternatives with a lesser water footprint are available. The second issue which is also rarely tackled is freshness. Truly organic beauty is quite close to food and as such, it has a life cycle that begins with production rather than when you open the bottle. At the beginning of that lifecycle, its nutrients and other bio-active elements are usually at their peak and they naturally decline over time. Even if that is a process that can’t be eliminated, it can be contained subject to a good processing, handling, and storage policy. A skincare product can be 100% certified organic and have 0% nutritional value for your skin if it has been sitting on a shelf under a hot lamp. That is why I recommend going past the labels and knowing how a company works behind the scenes. If you are paying a premium for an organic beauty product, you ought to get your money’s worth. What I have found most challenging is getting Akhal Beauty’s name out there. It is very difficult to compete with established companies that have big advertising budgets. Luckily, we have been able to attract a steady stream of customers who love our products and are now regulars as well as our best ambassadors. Within the ethical fashion community, there's a big question we ask which is 'Who made my clothes?'. In the scope of Akhal, who made your products? Can you tell us a bit about them? Our plant-based skincare products are all made by indigenous women from the South of Morocco, most of whom are part of a network of independent women’s cooperatives. Many of the women involved in the cooperatives did not have a job prior to joining it. By harvesting Argan nuts, Prickly pears and Rose blossoms and transforming them into beautiful all-organic skincare products for our customers, they earn a steady income that opens opportunities for them and their family. In fact, a joint study between the University of California and the National School of Agriculture in Meknes has shown that girls from households that included a family member who worked in the Argan oil industry were significantly more likely to make the transition from primary to secondary school than girls from other households. This is the kind of positive impact that we work so hard to foster and promote. Keep good company. I have found this to be very sound advice! Surrounding myself with loving and supportive people has given me the strength to go after my dreams. Don’t underestimate yourself. I have made a lot of mistakes along the way and one of them was to rely on so-called experts for many things that I could have done myself. One example of that is the Akhal Beauty website, when I first started, I had hired a developer to set it all up for me and the result reflected his vision rather than mine and had a few too many bugs. After a few months, I made the painful decision to go back to square one and do it myself. I scoured developer forums to understand how to write code and watched a few how-to videos. Whilst the website is still not perfect, it reflects who I am and I am comfortable updating it myself which I did not think was possible when I first started. Where do you envision Akhal in the future? I feel very lucky to have met so many interesting people since I started this journey, whether it is the women we work with in Morocco, our customers, or other brands in the wellness space. I am looking forward to continuing the conversation we started about ethical beauty and highlighting how our decisions here in Australia have an impact elsewhere and it is in our power to make them actions for good. What or who inspires you to what you do on a daily basis? The list is quite long but in the difficult moments, it is my grandmother that comes to my mind. She was married off to an older man at age 13, became a widow very young and had to care for 11 children despite not being able to read or write. Life threw her many curveballs, yet she is the most optimistic and generous person I have ever encountered. She was also the driving force that pushed all her to children to get a high school education so they can have a say in their future. At that time, in Morocco, that was visionary. When I am in Sydney, I usually go for a run at a park near my place, I do my stretches, have a quick shower, and then eat a light breakfast. I have also made it a habit to take 20 minutes to drink my homemade antioxidant herbal tea and catch up on the news. Another thing, I have been doing for the past 6 months which has helped me a great deal is to make a list every evening of the things I want to accomplish the following day. That means that as soon as I turn on my computer in the morning I can hit the ground running and that has helped me stay focused. Sapiens by Yuval Noah Harari. It’s an enlightening account of how our species has developed over the last 150,000 years. He also discusses why Homo Sapiens has managed to dominate the Earth unlike other species such the Neanderthals. Harari’s argument is that Sapiens flourished thanks to their ability to believe in things beyond imagination and work together on a large scale. That translated in the creation of political, economic, and legal institutions that formed the basis of a peaceful society.